Angie, of Burton Avenue, created the Halloween garland above using a freezer paper stenciling technique on burlap. Visit her blog for step-by-step instructions for making both the banner above and the reverse version, shown left. Visit the Wee Waldorf blog for a tutorial on making this Earthly Love Stenciled Tote. 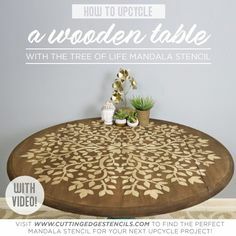 You’ll find step-by-step directions and the stencil design as a free download.